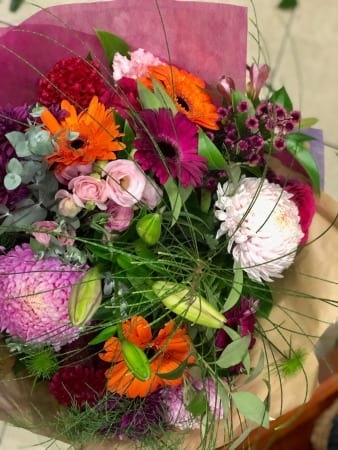 The Rebecca Bouquet is a grand mix of seasonal blooms including long lasting lilies, romantic roses, lisianthus, gerbera and fresh foliage in a bright vibrant flower bouquet. Say it all with this stunning bouquet from Amaranthine Flowers By Design. Your local florist in New Lambton, Newcastle. Perfect floral gift for Birthdays, Anniversary, Mother’s Day or any occasion. Same day delivery available to all areas of Newcastle and Lake Macquarie, including John Hunter Hospital, Newcastle Private Hospital, Lake Macquarie Private Hospital, and Mater Hospital. Delivery available six days a week (Monday-Saturday) and Mother’s Day Sunday Delivery.